Impressionist Painting of Harvesters in the Forest, "From the Farm"
On their way to the plantation, four harvesters wade through a stream in the middle of a forest as they carry goods atop their heads. 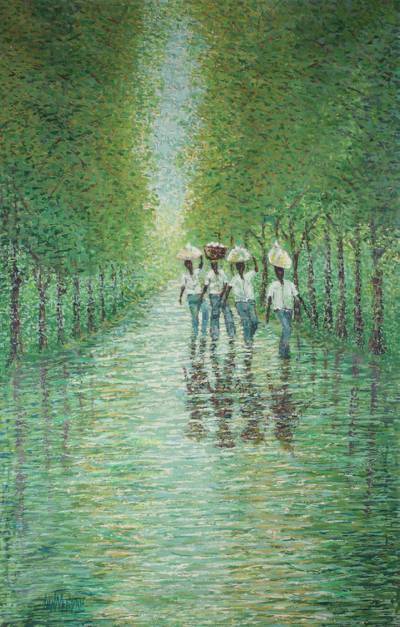 Ghanaian artist John Atta Mensah paints this scene in the impressionist style, using dabs of the paintbrush to capture the lush greenery of the forest. Atta believes in working hard to develop his art; he says "The sky is the limit." John Atta Mensah was born in 1963. He attended a Roman Catholic elementary school, after which he went to a prestigious art college from 1981 to 1984. During this time, and for some five years after he completed his education. Mensah elaborated a limited number of creative works to support himself, until a friend of his, also an artist, opened a new avenue for him. Atta was introduced to a famed art gallery. From this point onwards, Atta established sound bases for himself personally and his practice - in other words, he has been painting seriously to date. Atta believes in working hard to develop his art; he says "The sky is the limit." His paintings are inspired by everyday life, market scenes in particular, and possess a still, restful quality, infusing abundant appeal. His mastery of colors is harmony, making his works part of collections inside and outside of Ghana. He has participated in exhibitions throughout Ghana. I've just received Mr. Mensah's wonderful slice of life, entitled, ""To Work"". It reminded me of my father-in-law, riding his bicycle to and fro in Jamaica and will be treasured in our family, Thank you, Mr. Mensah.